throughout the day.The first trip in 2010 was a huge success with everyone who went raving about what a fantastic time they had. with all the latest club music playing from our group of JetBou DJs. 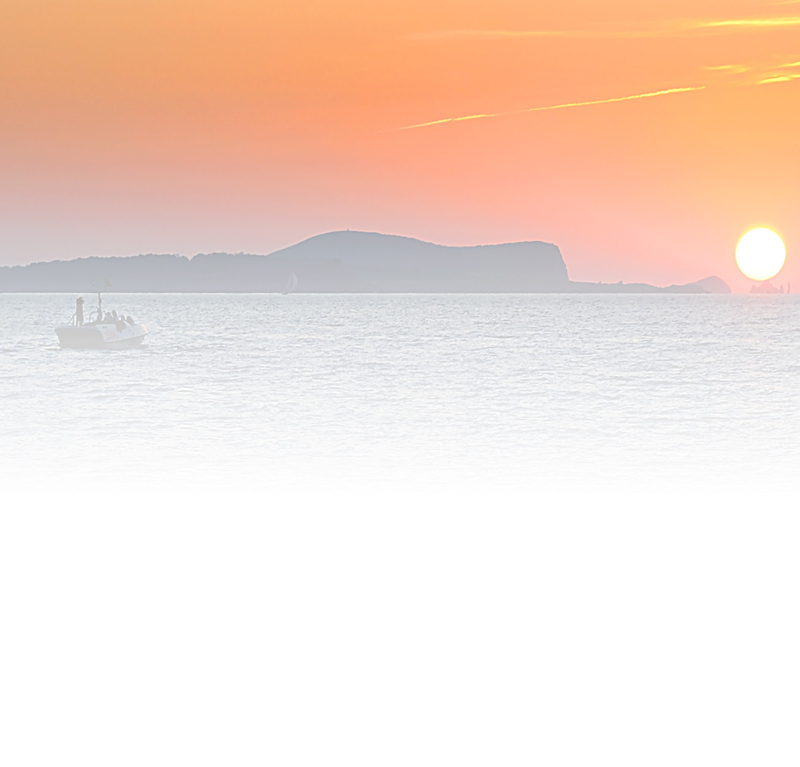 On the lower deck with room for sun bathing and seating there is a quieter area for families to enjoy the trip, view the fish beneath the boat and take in the breathtaking views Ibiza’s coast line has to offer. The boat has a bar on board andthere will be opportunities for all to jump in and have a swim. As with all big excursions out to sea wind and weather play a large part in final plans.The group and glass bottom boat will depart heading North. 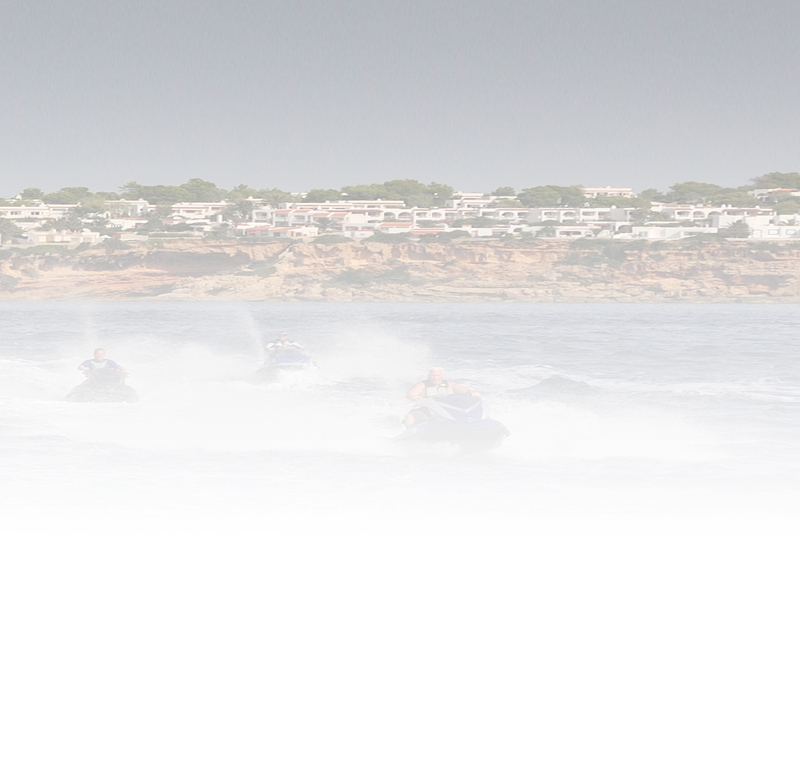 On-route there are some amazing views and points of interest and the jetskiers will get the opportunity to ski under the famous Margarita Island arch.First stop is at Puerto de San Miguel. 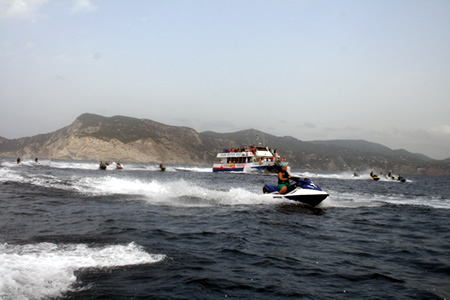 Jet Skiers will be able to tie up between the safety ribs and come aboard the main ship for refreshments. Continuing on we will pass the picturesque coastline and stop briefl y at Bennirras bay, a beautiful small bay surrounded by pine clad hills. 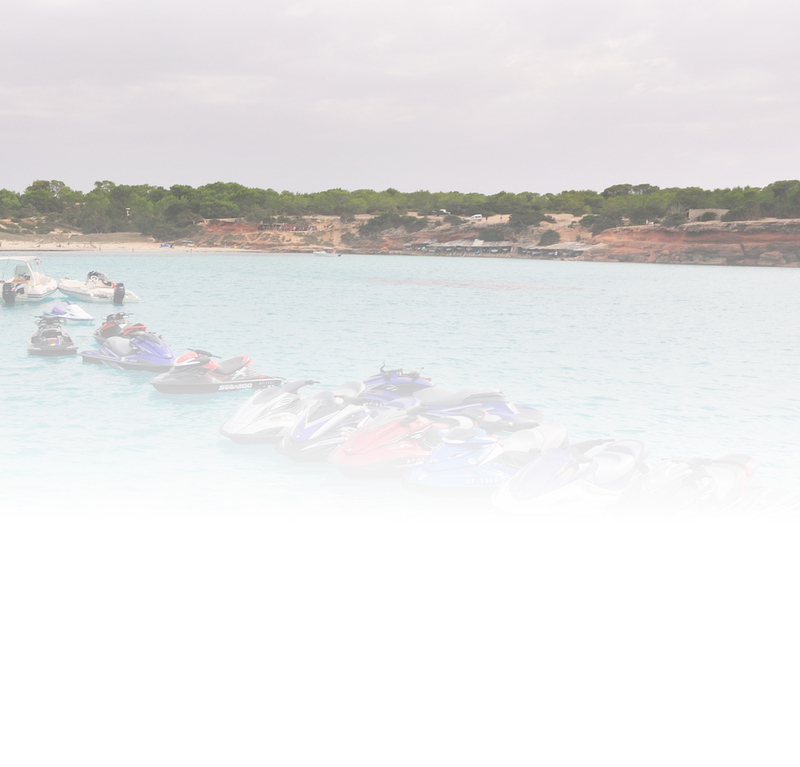 We will then make our way to Portinatx at the extreme northern tip of the island again allowing the jetskiers to tie up and come aboard to make a final short cruise into the port (skis will be supervised during visit). You can disembark and sample the delights of this popular tourist spot during our short visit. 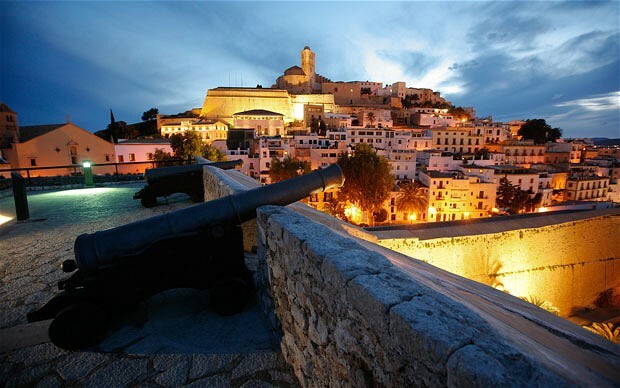 Portinatx is Ibiza’s largest resort and well know beauty spot, with sandy beaches and a great choice of bars, restaurants and shopping facilities. 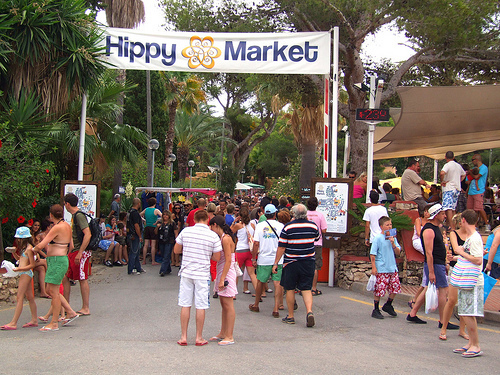 The Ibiza Hippy Market is one of the top attractions and a must see for all. Ibiza has strong artistic roots going back to the early 60s when artisans, painters and designers flocked to the island to experience its unique atmosphere, light and freedom of expression. All of this comes through in the markets held on the island where hand made items of clothing and jewellery can be bought. We visit the biggest market in Es Caná. The market is open 10am until 6.30pm on the grounds of Club Punta Arabí. Countless stalls huddle beneath the shade of pine trees in the winding pathsbetween the white villas. sounds. Each year we organise a wild late night out to Pacha for those of you who like to party hard and dislike sleep! 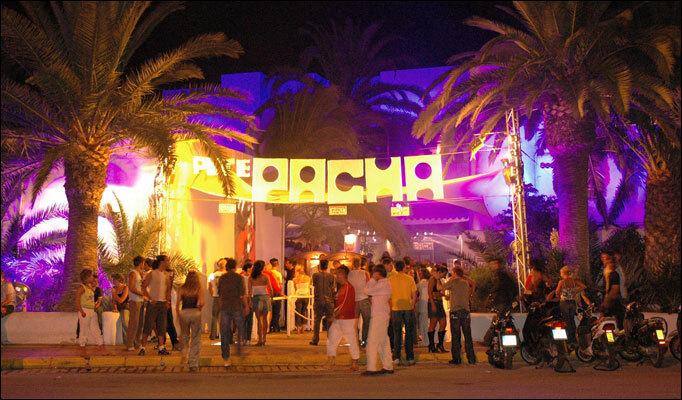 A coach will collect you from Mar I Pins for a night to remember at Pacha. Its a holiday for the whole family and not just the jetskier!